Who remembers back to the yuppie hay-days back in the 1980s? The typical yuppie wore a power suit (with hideous, enormous shoulder pads if the yuppie in question was female), carried a mobile phone and drove a BMW. Nowadays, power suits and big shoulder pads have disappeared (hooray!) and a mobile phone is likely to be carried by a teenager near you (and it won’t look like a brick, either – the phone, not the teenager). BMWs, however, are still luxurious, well designed and classy vehicles. Like mobile phones, they have lost their brick-like look and have fully joined the 21st century. One of the internationally popular 3 series range, the BMW 325i, is an excellent example of how BMW has taken classic luxury and style and blended it with modern engineering and safety. To look at, the BMW 325i combines up-to-date aerodynamic features with curvaceous lines rather than the harsher angles typical of the 1980s. 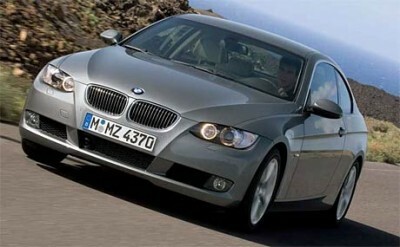 The distinctive BMW grille is still proudly displayed up front, fitting neatly into the tailored lines of the 325i. The looks of the BMW 325i are backed up by its actual performance figures. The 2.5 litre engine delivers a maximum power of 160 kW at 6500 rpm and a maximum torque of 250 Nm at 2750 rpm, which is enough grunt to see the BMW 325i accelerating from 0 to 100 km/h in a very crisp 7.0 seconds (7.7 seconds for the automatic variant). The BMW 325i six-speed manual has a top speed of 245 km/h, and it consumes 8.4 litres/100 km on average (derived from 12.1 litres/100 km city driving and 6.2 litres/100 km freeway driving). The BMW 325i automatic lags slightly behind the manual variant on both counts, having a top speed of 242 km/h (which is still very quick!) and an average fuel consumption of 9.0 litres/100 km. We all know that the unexpected can happen at any moment, making safety an important consideration. As always, BMW has done a good job safety-wise on the 325i. The standard DataDot technology is complemented by ABE, dynamic brake control, cornering brake control, automatic stability control plus traction and dynamic stability control, which all combine to make the BMW 325i safe and stable. If you are unfortunate enough to collide with something (or if some idiot collides with you), the driver and front airbags will come into play (these airbags have an occupant detector function), as will the front side airbags, and the head airbag front and rear. BMW continues to shun the centre lap belt in the rear – all five seats in the 325i have been fitted with three-point seat belts, and the centre rear seat has a headrest, as do the other seats. With the average family having 2.5 children, it’s good to see that no half-measures have been taken for the passenger in the “point five” position in the BMW 325i. On the inside, the BMW 325i is beautifully upholstered in Dakota leather. During a long drive, your comfort will be ensured thanks to the electric seat adjustment for the front seats (and the BMW 325i has a memory function for the driver’s seat position) and the retractable front arm rest. The well-set out cabin and dash can be decorated with one of four trims (titanium matt, burr walnut, brushed aluminium and natural poplar) all of which are lovely to look at. Cruise control with brake function, an in-dash CD/radio with a 6 CD changer, a multifunction steering wheel and an onboard computer are some of the technological bells and whistles offered as standard on the entry-level BMW 325i. Display control with a 6.5″ colour monitor and Business Navigation is another extra touch provided for your convenience. Alongside all these attractive standard interior and exterior features, BMW offers a wide range of options for the 325i, the most notable being the M Sport package, which includes, among other features, sports suspension (and a special sporty steering wheel!). Exterior options include metallic paint, a climate comfort windscreen, electric sunroof, adaptive bi-Xenon headlights and an alarm system. On the inside of the 325i, optional extras on offer range from upgrading the navigation system so it has an 8.8″ colour monitor with TV and voice recognition, or things that will please the body rather than the mind, such as BMW sports seats, .heated seats and a electric rear roller blind. So, you’re thinking about a little luxury in your next car. The BMW 325i might be the one to give it to you. For any more information on the BMW 325i, or for that matter any other new car, contact one of our friendly consultants on 1300 303 181. If you’d like some fleet discount pricing (yes even for private buyers! ), we can submit vehicle quote requests out to our national network of BMW dealers and come back with pricing within 24 hours. Private Fleet – car buying made easy!